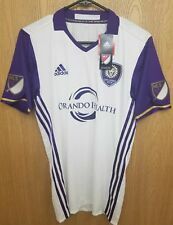 Adidas Orlando City Authentic MLS Soccer Jersey. •100% Authentic. Its lightweight material and sleek side stripes will keep you feeling comfortable and looking confident even when the match is close. Everyone will know which squad you love to watch with the authentic Manchester United crest embroidered on this tee. Adidas Skateboarding T Shirt Jersey Climalite XL . Condition is Pre-owned. Shipped with USPS First Class Package. There is a small stain below the left armpit and a faint spot on the back. Please check the photos for the condition. If you have any questions feel free to contact us. vintage ADIDAS soccer Jersey RED size 2XL ** measurements pictures Great used condition Thanks for looking and check out my other Vintage clothing for sale in my listing! Color: Purple / Gray. Item Specifics and Condition:Great condition. Adidas Skateboarding Clima Club Soccer Jersey Black / Black CF5798 Sz Large NWT. Condition is New with tags. Shipped with USPS First Class Package. Adidas Jaq 3 Stripe Jersey. Condition is New with tags. Shipped with USPS Priority Mail. Color: Black and White. Length from top shoulder to bottom: 28". Dramatic light and dark contrasts sweep the front in a diagonal slant. Wide, tonal 3-Stripes blocking crosses the lighter half. We partner with the Better Cotton Initiative to improve cotton farming globally. Product code: CE1830. Featuring a special design by Mark Gonzales, this long sleeve top is made of lightweight sweat-wicking fabric and has a roomy fit that's perfect for skating. 100% polyester tricot. SIZE : XL (ADULT). COLOR : Blue and white. Length: 29“. - UNLESS THERE IS COMMUNICATION, a case will be opened if the winning item(s) goes unpaid after 72 hours. So, I essentially allow 1 week for an item to be paid. Adidas FT Outline Shorts DV3273 Navy Blue NWT XL FAST FREE SHIPPING. Condition is New with tags. Shipped with USPS Priority Mail.